Often bike models at the end of their production life are excellent machines representing the pinnacle of that design's development and refinement. However, none of that logic applies to the Norton Commando.It is often the case that cars and bikes at the very end of their production life are good buys. In the last days before a new model is launched, every conceivable bug has been found and resolved by the manufacturer, and every extra has been added. Combined with good discounts, end-of-line bikes can be solid gold for the rider who is not fashion conscious. But there are exceptions - and the last of the Norton Commandos is one of them. The Commando has a long and mixed history. From day one of its launch at the Earls Court show of 1967, it was an outdated compromise. With an engine which was originally designed in two weeks, in 1948, the remarkable thing about the Commando is that dedicated development engineers kept the corpse alive for so long. During its 10-year life, the Commando was over-bored, tuned and, if this is the correct word, refined to its final incarnation as the Mk. III Interstate. In truth, Commandos can be fun. 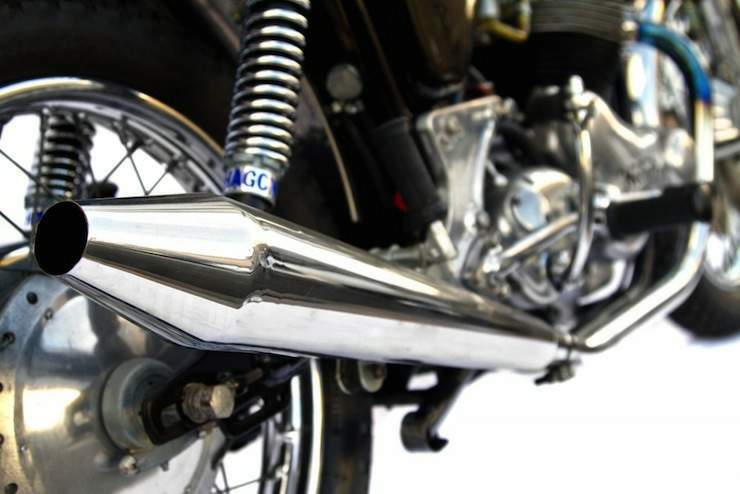 With a skilled spannerman, the handling can be superb, and the Commando was actually a successful endurance race bike - such is the reliability which can be built into the motor. But the problem still remains of having a powertrain which left Bert Hopwood's drawing board just three years after the end of the Second World War. The left-hand gearshift on the Commando Interstate destroyed the buttery feel of the original, marring one of the antiquated designs bright spots.At the heart of all Commandos is a big, very old fashioned, air-cooled, push-rod Twin. It wasn't even the engine which Hopwood wanted to produce in 1948, so by the time 1967 arrived it was a true dinosaur. Despite a fanatically loyal American customer base, Norton missed out on the cult niche occupied by Harley-Davidson and so the company found itself competing with unit-construction, overhead-cam four-cylinder products from Honda and Kawasaki. Even worse, riders were starting to object to kick-starting bikes. Heavens above! 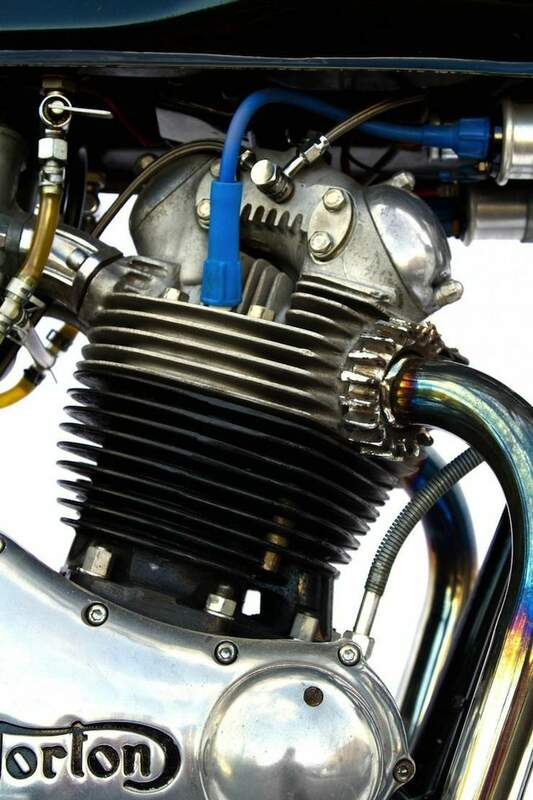 Imagine a motorcycle with an electric starter. What would those dastardly Japs come up with next? Finally the company was also in trouble with legislators who demanded quieter and cleaner Nortons, and it was thought (although the legislation never actually transpired) gear-change pedals on the left-hand side. 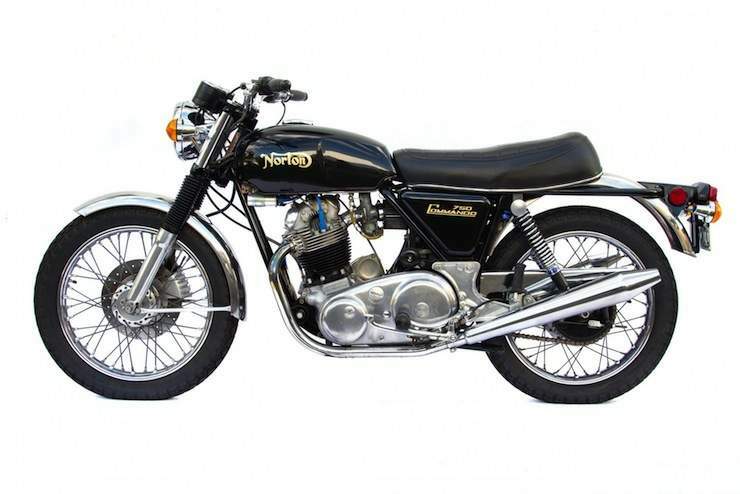 Norton's solution was the MKIII Commando which was quieter and had a left-hand gearshift and an electric starter. There was also a 45-lb increase in weight, and the result was a parody of the lean, lithe sports bike which Dr. Stefan Bauer hurriedly drew in 1967. Where to start? 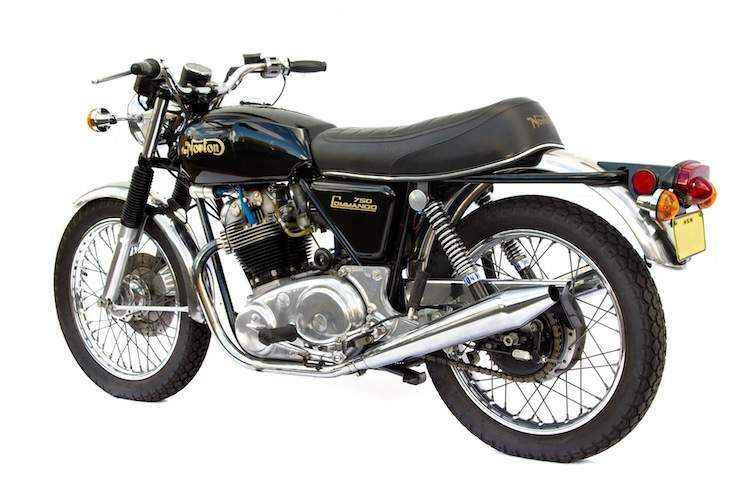 By 1975, the original 497cc Hopwood-designed Dominator engine had been taking illegal steroids and became a whopping 828cc. Unfortunately, the capacity does not produce arm-wrenching, buttock-tightening Commando racing engine power and torque but dull, supersize-me, flab. Ironically, it results in a very mid-'70s Harley-Davidson boulevard cruising style. With a beer belly and beard, any middle-class Hells Angel aspirant would feel at home. The isolastic rubber engine mountings do prevent the vibration reaching the rider, but the motor was now so heavily muffled and dull that it became a soulless lump. Imagine an interview with a particularly pedantic IRS official when you have failed to file your tax return on time: that's about the excitement level. As with the gearbox, the Commando Interstate made an impressive leap backWards with its horrid brakes, which were abysmal and required a lot of effort at the lever. The Commando still had a separate gearbox - an idea which was old-fashioned in the 1930s. However, the original Norton gearbox was a flawless piece of engineering and gives one of the sweetest, most accurate actions of any motorcycle - and that includes any current bike. So, one thing is perfect on the Commando? Well, no, actually. With the gearshift on the left, the feel of the 'box is destroyed. Now, instead of a knife through butter, it was the motorcycling equivalent of making love wearing 20 industrial-strength prophylactics. Intellectually you might be aware of the act, but your body would never know what's going on. Ironically, the electric starter does actually start the motor - at least on the very hot day we had the Commando on test. At Norton, the in-house joke was that the starter provided "electrical assistance." The idea was that the rider kicked mightily whilst popping the electric starter. Together, man and solenoid would fire up the big Twin. For such a dull thing, the bike rides satisfactorily, but the brakes are dire - truly, breathtakingly awful. A huge amount of effort is required to get the pads to bite into the stainless steel discs, and the reach to the front brake lever is immense for anyone whose first cousin is not Oscar the Orangutan. The Commando Interstate's 828cc powerplant was a bored-out version of the 497cc engine designed by Bert Hopwood way back in 1948. When the Commando debuted in 1967 the engine was already old, by the time it powered the Interstate it was ancient.This need not have been the case because the Commando's original disc came from Lockheed and worked so well that it is still the preferred option for classic racers worldwide. However, in an attempt to modernize the Commando, Bob Trigg was ordered to produce a more cosmetically attractive caliper. In terms of looks, Trigg was successful - only failing in the trivial area of producing a brake which was capable of stopping the bike. To round off the package, the switchgear and ancillary fittings look so cheap and nasty - and the Commando was neither of these. And so to the final conundrum: Why 1979 when the last Commando was built in 1975/76? Here's the fuzzy bit of history. When the Norton works, based at the old Villiers factory in Wolverhampton, went into receivership, the production line was closed. Around 1500 Commandos were in the process of being built - all silver Mk. III Interstates. Dennis Poore, previously owner of the Norton brand and by now in charge of NVT Ltd., at Shenstone, prompted the receiver to re-start all the "work in progress" against a solid guarantee to purchase all Commandos which emerged from Wolverhampton. They were delivered mainly, although not exclusively, to British dealers during 1977 from Norton's new base at Shenstone. 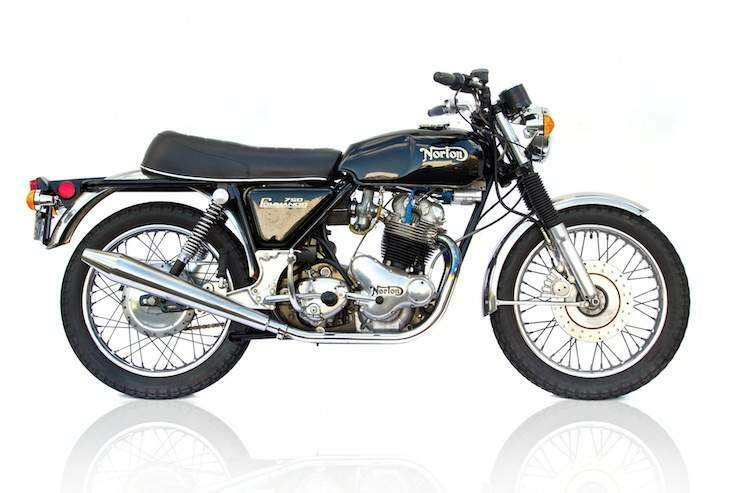 Norton has always maintained a loyal following in America and an attempt to resurrect the brand is still in the works. For now riders will have to be content with the vintage pickings.However, the last 25 bikes were retained by Norton and retailed directly - and at a very handsome profit. 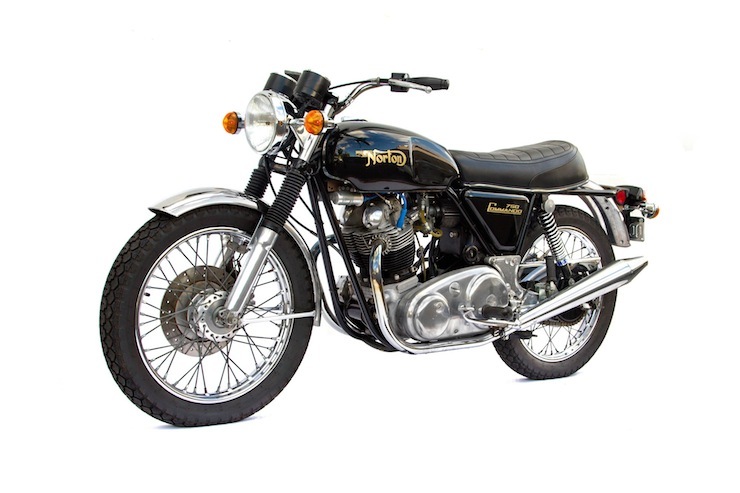 The last ever Commando was sold to a customer who insisted on having the legendary Norton tuner, Ray Petty, present him with it at a formal ceremony. Here he had a piece of valuable history - the last ever Commando to leave Norton. Cheers and flag-waving all round. Except, so the folk tale goes, that the Norton works manager John Pedley took exception to a "civilian" having the final Commando and had his workers build another one with an even higher engine and frame number - truly the last - for his own personal use. And that story might well be true in that it came from an extremely well connected ex-Norton man. Today, Commandos can be made into truly brilliant bikes. But the way to go is not a standard MkIII but to seek the help of Norton Guru Les Emery who will build a bike which is everything that a Commando should be. Thanks to Mike Jackson, Norton's Sales Director at the time for providing invaluable background information for this article.